Immaculate! 6 bedrooms and 5 bath ranch sits on approx. 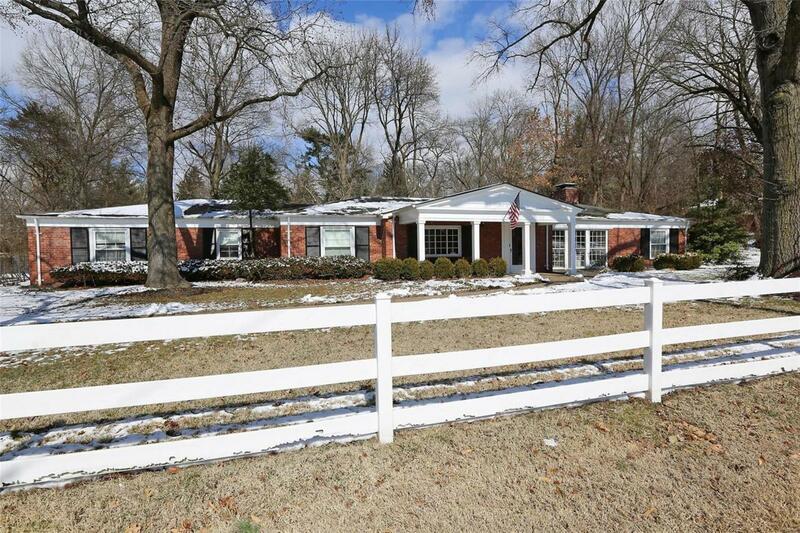 1 acre with beautiful mature trees & inground pool. The minute you walk in you will notice the beautiful wood floors throughout. Open and airy floor plan best describes this home with plenty of natural lighting flowing thru. Formal living room with fireplace opens to vaulted family room with wet bar! This is perfect for entertaining! Chefs kitchen with Carrera countertops, stainless steel appliances, canister lighting, and French doors opens to the court yard area. 2 separate wings consisting of 5 other bedrooms and 3 baths offer many possibilities for In Law quarters or out of town guest. Main floor laundry. An abundance of storage!! 4 car garage. Ladue school District walking distance to school. Enjoy those family barbeques around the pool or just reading a good book. Come on in and you will agree that this home is not just a Gem! But price to sell!